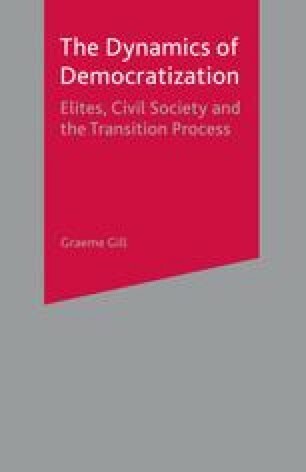 The literature on transition to and consolidation of democracy emerged as an attempt to explain developments in Latin America and Southern Europe in the 1970s and 1980s. Most of the case studies come from these two regions, and most exponents of this literature, if they had a regional specialism, were specialists in one or a number of countries of these regions. However, the most spectacular, because of its range, unexpectedness and geopolitical power of the subjects, instance of democratization occurred in neither of these two regions, but in the former Communist world of Eastern Europe and the former Soviet Union. The issue this raised was whether the sorts of explanations that had come out of the transition literature could usefully be applied to the Communist-post-Communist situation. Some sought to use this literature in their analyses of communist transitions1 while others believed that the Southern European and Latin American experiences were so different that they could not spawn a useful explanatory literature for these other cases.